Police at the scene of the last incident on Boxing Day. 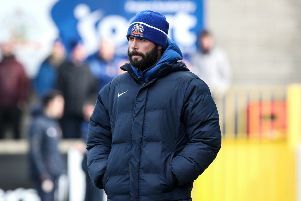 Glenavon fans must be on their best behaviour on Saturday as any further trouble at Mourneview Park could hit the club financially. As a result of disturbances on Boxing Day the Safety Certificate issued to Glenavon FC by Armagh Banbridge and Craigavon Council has been amended to reduce the capacity allowed in the Crescent Stand. It is therefore vital that fans do not instigate or retaliate to any incidents which could lead to the ultimate sanction of the strand being closed altogether. On Saturday admittance to the Crescent Stand will be by ticket only, a stipulation by the council. The match is not all-ticket, just access to the Crescent Stand. Tickets will be on sale from the club office which is open from 9.30 to 12 noon daily. Those buying tickets will be asked to provide their name when doing so. Season ticket holders are reminded they must also obtain a ticket to gain admittance to the Crescent Stand. Tickets will not be on sale on the day of the game. Those supporters with tickets must retain their part of the ticket as access to the Crescent Stand, before or during the game, will only be permitted on production of that ticket. Supporters are reminded that alcohol, glass containers, glass bottles, fireworks and flares are prohibited from all public areas within Mourneview Park. Due to health and safety restrictions all tins and plastic bottles of drink (with tops attached) will also be banned from all the stands. In accordance with the Safety Certificate issued by Armagh Banbridge and Craigavon Council this game has been designated as a strictly ‘segregated game’. Trained search/security personnel are being drafted into the ground to assist stewards to search persons for any prohibited items. Any person detected trying to bring any such item into the ground or stands will have it confiscated and be denied access. If the prohibited item constitutes a criminal offence then the person will be handed over to PSNI officers with a view to prosecution. Anyone deemed drunk will not be permitted through the turnstiles. The PSNI also wish it to be known they will deploy four uniformed ‘spotters’ in the ground who will be equipped with hand held video recorders for the purpose of gathering evidence against those engaging in criminality or anti-social behaviour.